When I first saw the below photo — some accidentally hilarious snapshot that's no doubt made the rounds on the internet for some time now — I thought it was funny, though I couldn't put my finger on what seemed strangely familiar about it. Then I remembered a slide ID I had to learn back in Art 1A. 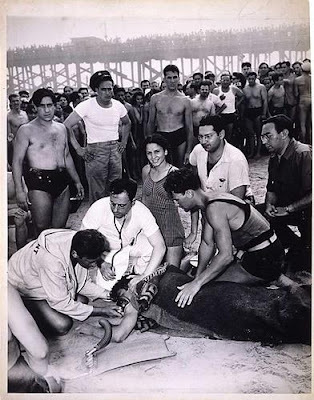 This photo, by Weegee, depicts a drowned man at Coney Island. Despite the grim situation, however, the woman in the photo's center is smiling. It's not a genuine smile, I don't think, but more of the kind of automatic facial expression that people so often make when you stick a camera in front of them. Given the woman's proximity to the recently deceased, I'd bet she's either a relation of his or part of the rescue crew. In either case, it's totally inappropriate for her to be grinning — unless, of course, she really didn't care for him and she's not afraid to let everybody know about it. The top photo reminds me of the Weegee in the sense of people being programmed to perform a certain way when being photographed — smiling or throwing your arms around your friends in order to make it clear to anyone who sees the photo that you are, in fact, a group. In the bottom photo, the contrast between the men's genuine reactions and the woman's artificial one makes for art. In the top, the result is three girls determined to blankly hug and smile for a photo regardless of what's happening around them — namely the pooling of freshly spilt beer. Just as the Coney Island woman probably didn't anticipate how strange she would look if she smiled for the photo, the girl in the middle clearly threw her arms around her friends without realizing that putting her arm at that angle would spill her beer and make her look foolish. 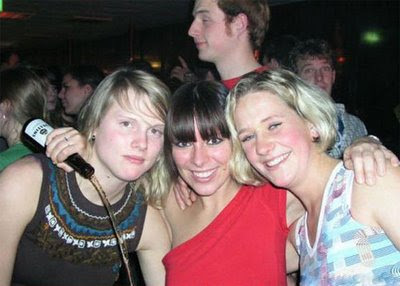 Strange what people will do in a photo. tall guy. that's funny too.